In the tree of life, some branches lead to organisms that retain tissue-regenerating abilities that our evolutionary ancestors lost long, long ago. Organisms that excel in tissue regeneration, organisms such as salamanders and zebrafish, are able to repair injured hearts and spinal cords, and even regrow lost limbs, because they possess certain genes—which happen to have human counterparts. So, if we have tissue-regenerating genes, too, why are our tissue-regeneration capabilities so limited? The answer, it turns out, may have something to do with how these genes are regulated. According to researchers at Duke University, what we’re missing are gene regulatory elements that can engage our neglected tissue-regeneration machinery. These gene regulatory elements, the researchers suggest, could be installed by means of genetic engineering. This possibility was explored in a paper the Duke team published in Nature. The paper, entitled “Modulation of Tissue Repair by Regeneration Enhancer Elements,” appeared online April 6 and described how the Duke team looked for genes that were strongly induced during fin and heart regeneration in the zebrafish. After transcriptomic analysis suggested that a gene called leptin b (lepb) was especially important in tissue regeneration, the team scoured surrounding areas of the genome for enhancer elements. Ultimately, the Duke researchers found what they call tissue regeneration enhancer elements (TREES). TREES appear to trigger gene expression. Also, they can be engineered to modulate the regenerative potential of vertebrate organs. In their work with the zebrafish, the researchers whittled the enhancer down to the shortest required DNA sequence. In the process, they discovered that the element could be separated into two distinct parts: one that activates genes in an injured heart, and, next to it, another that activates genes in an injured fin. 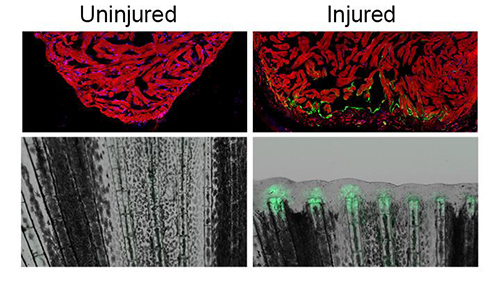 The researchers fused these sequences to two regeneration genes, fibroblast growth factor and neuregulin 1, to create transgenic zebrafish whose fins and hearts had superior regenerative responses after injury. Finally, the researchers tested whether TREEs could have a similar effect if they were introduced into a mammalian system, the mouse. They attached one TREE to a gene called lacZ that produces a blue color wherever it is turned on. Remarkably, this TREE, which was borrowed from the genome of zebrafish, was able to activate gene expression in the injured paws and hearts of transgenic mice. “We are just at the beginning of this work, but now we have an encouraging proof of concept that these elements possess all the sequences necessary to work with mammalian machinery after an injury,” said Kenneth D. Poss, Ph.D., senior author of the study and a professor of cell biology at Duke. He suspects there may be many different types of TREEs—those that turn on genes in all tissues; those that turn on genes only in one tissue like the heart; and those that are active in the embryo as it develops and then are reactivated in the adult as it regenerates. Eventually, Dr. Poss thinks that genetic elements like these could be combined with genome-editing technologies to improve the ability of mammals, even humans, to repair and regrow damaged or missing body parts.